Hi guys, this is Nojical and today I am going to share with you guys a custom deck that I’ve made for Clash Royale. This deck, by far, is an auto-win deck for most of the time, easy to play but bring tremendous results. I was able to get 3 accounts to around 3800 trophies using this deck. The deck is pretty simple, with the offensive focus is Elite Barbarians, supported by Executioner, Bomber and Ice Wizard. There are 2 spell cards and 2 neutral cards. Here are the details of each card. Whenever there are Elite Barbarians on the playground, there is madness. This card spawns 2 strong barbarians, has the damage of Mega Minion, the health of Baby Dragon and the hit speed of Spear Goblins. Their strength, agility and durability make them one of the scariest cards in the game at this moment. A new, cool card that is extremely tanky and deadly. He destroys everything in front of him and is extremely effective versus large groups of enemies. The reason I chose this card over Valkyrie is that it has range and a good damage and costs only 3 Elixir. While people argue that Valkyrie has a more health, Bomber gives you the advantage of keeping a distance with the enemy, thus better supporting the Elite Barbarians and other troops. A cool feature of this card is that it slows down the enemy’s troops tremendously. It is a perfect match for the deck because of this feature. A good offensive and defensive card that I will mention later. Best card of the game. Period. 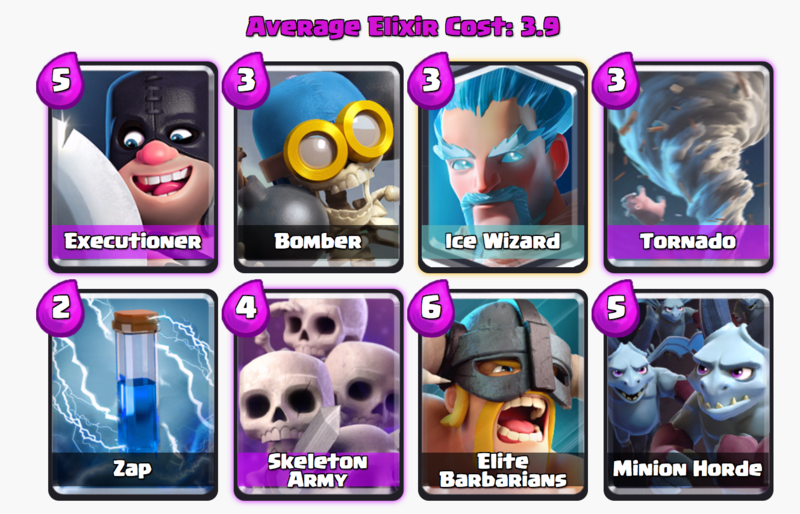 It clears out a Skeleton Army, reset Sparky, Inferno Dragon, etc. and weakens Minions. A good card, but in most cases, it is only good for defensive. I will tell you why. 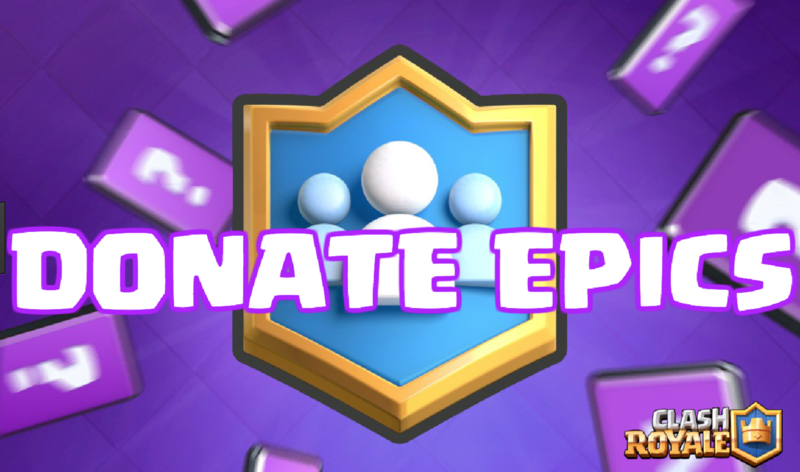 SuperCell has a system that matches you with someone uses similar cards with you, so there are chances that you will bump into Elite Barbarians users. This card costs 3 Elixirs but takes good care of any ground troops if they are not stopped properly. The best scenario is that you have either Bomber or Executioners on hand. Wait for your Elixirs to reach 10. If you drop a Bomber behind the crown tower, wait for Elixir to refill a little bit, then drop the Executioner, vice versa. The last troop is drop in would be the Elite Barbarians. 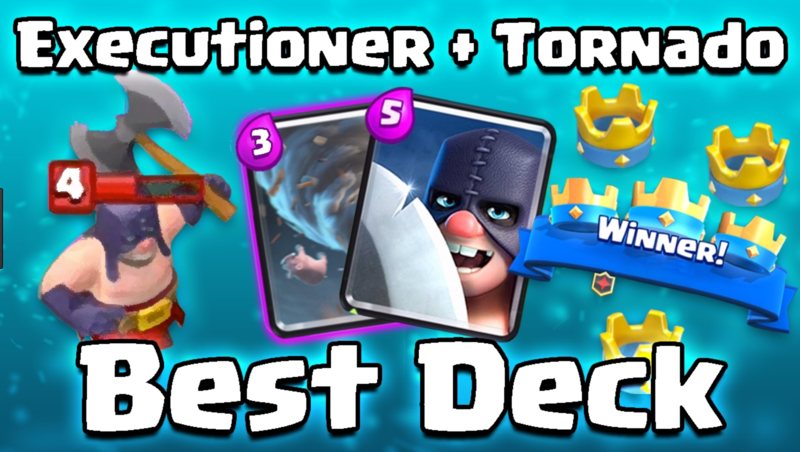 Again, remember, Tornado and Executioner are a deadly combo. Tornado is good offensive card if they ever drop a mob on your offensive units. The main point of this deck is to clear any waves that try to stop your barbs or to use tornado to move the units away from their tower so your barbs can bash the tower and use other cards to defend the push later on. The best defensive strategy is to drop executioner and tornado. This will kill any large group of units. The trick is to pull them to the middle so two towers can shoot them and have your executioner do massive damage. Skeleton army and minion horde is good versus the tank units but you need to be careful of the zap. Never over summon as fireballs can destroy both of them. The ice wizard is also extremely good as a defense/tank unit to slow down the attack speed. REMEMBER! Elite Barbarians can be used as a defensive card as well. If possible, learn their deck before revealing tornado. Tornado is extremely useful when you need to get off one more attack and want to pull their units away from lane to get a clear shot at tower. It is also good to re-direct enemy units.